Thunderbolt™ powered SDI and HDMI output. Io Express delivers desktop-level functionality that"s powerful enough for the edit suite, but sturdy and portable enough to handle life in the field. Io XT is the ideal portable companion for lightning-fast video capture and playback for professional post production and on set applications. 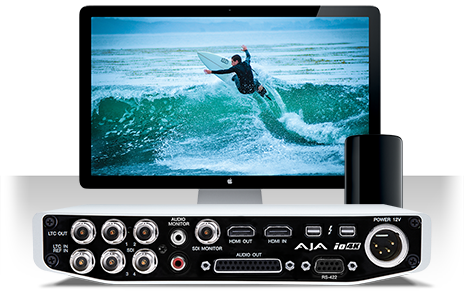 Compact, portable and powerful, Io XT is loaded with high-end features including 3G/Dual Link/HD/SD-SDI, Component Analog and HDMI connectivity, to bring true desktop-level power to any Thunderbolt™-enabled Mac, with full uncompressed HD and SD 4:2:2 and 4:4:4 capable video and audio connectivity.